Stunner. Of course the '09 Blue Jays who jumped out with an early lead in the American League East weren't for real. When Toronto dropped 9-straight in late May including being swept by division rivals Baltimore and Boston, the writing was on the wall. It took a month and a half for general manager J.P. Ricciardi to come out and say it: UNNNNCCCCLLLLEE. For Blue Jays fans, all seventeen of you, what's it like to have 70+ plus games remaining in the regular season and have your upper management announce their folding this one in? For Vernon Wells, Alex Rios, and Aaron Hill, your in this one for a while, watching the best pitcher in baseball head to the U.S. isn't exactly encouraging. However, for the rest of major league baseball get out your prospects and package 'em up because a pitcher like Doc Halladay only comes around once in a Blue Jay moon. The rumours are running wild and I've decided to give J.P. some amateur advice. To the Sox, and not those white ones. The Red Sox are known for having one of the best minor league machines in all of baseball. A minor-league system that has produced such talents as Jon Lester, Jonathan Papelbon, and the reigning A.L. MVP Dustin Pedroia. It's no secret that Boston could offer Ricciardi & Co. the top package for Doc's services. G.M. Theo Epstein could float prospects like Clay Buchholz, whose already thrown a major league no-hitter, and closer of the future Daniel Bard whose 100 mph heat entices everyone. Halladay would join a staff that is already loaded with talent from ace Josh Beckett to fellow All-Star Tim Wakefield in the midst of one of his best seasons. 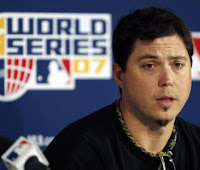 Lefty Jon Lester and any combination John Smoltz, Brad Penny, and Daisuke Matsuzaka would round out the toughest staff the postseason has seen in twenty years. The Red Sox could afford to extend Halladay after his 2010 season which would be the final on his current contract. With that said, does Toronto really want to see Halladay multiple times a season? Do their fans want to see Halladay celebrate multiple postseason wins? Bottom Line: The Red Sox would be willing to talk but they've got to feel they have bigger needs and holding onto their prospects has seemed to work out for them in the past. The Jays & Sox flirt, but won't go to bed together. To the Mets. Yes, paired with Johan Santana and pitching in the National League East, Roy Halladay would storm the Big Apple with force. Yes, the Blue Jays wouldn't lose Halladay in free agency without getting something for him in the process and they wouldn't have to be reminded of what they couldn't afford every season. Finally, the Mets would underpay for an ace for the second straight time. But no, none of that will happen. The New York Mets are a mess on the field and their minor league system doesn't seem to produce much more. When other division rivals who will not be named get into the picture, the Mets are sure to be blown out of the sweepstakes. If Toronto is looking to deal Halladay soon, they've got multiple opportunities and multiple teams that would love his services. Bottom Line: So for Mets fans, sorry but a second place finish in the National League East is about all your good for. Oh, and killing the prime of Johan's career. Good Day. Fine, To the Yanks. Funny thing happens in New York. You don't pull the trigger when you should have (Kennedy & Hughes for Santana) and when your ready to pull it, Joba and Phil Hughes aren't enough. As in the Red Sox case, a combination of Roy Halladay and C.C. Sabathia would be something to watch. Sabathia could slide into a #2 role, get out of the spotlight and back to pitching great and Roy Halladay could be the ace he's always been. A pitcher who seems to be able to handle everything and handle it with ease. The Jays would have the same problems they'd have sending him to Boston, watching him pitch in pinstripes wouldn't be get any easier. Joba Chamberlain could slide into a closer role in Toronto and they could put him back in the rotation, Phil Hughes would probably become a better pitcher with less on him in Canada but is that all you can get for Roy Halladay, a lock for 15-20 wins a season on a bad club as well. Bottom Line:If the Sox can offer up guys like Buchholz and Bard, as they say in New York, forgettaboutit. To the Dodgers Do they really need him? You could see the Dodgers giving a call to Toronto, why wouldn't they? With Halladay the Dodgers would be as much of a lock for making the World Series as anyone. Bringing Halladay to Hollywood and paring him with Billingsley would put the Dodgers in the mix with almost every American League team as well. However, the Dodgers are going to coast to the National League West championship and they've seemed to be able to handle teams like New York and Philadelphia, both teams they may see in the postseason. It'd cost the Dodgers most likely a major league talent like 21-year old lefty, Clayton Kershaw. Kershaw makes just $400,000 this season and has shown flashes of brilliance in his young career. The Jays acquiring a talent ready to pitch in the majors today would go a long way in easing their fans who would be forced to watch Roy Halladay on another team. Bottom Line: As I said in the beginning, do they really need him? The Dodgers are winning the West and once Manny turns it on, I find it hard to believe any team in the N.L. is playing as well as L.A. The defending champs, to the Phils. The Phillies would no doubt be giving the Blue Jays top infield prospect Jason Donald and if in a pinch as the Red Sox drive up the price on Halladay, possibly even top pitching prospect Kyle Drabek. Compaired to the likes of Tom Seaver and Bartolo Colon, Kyle Drabek would be enough to make J.P. Ricciardi look like a genious at the end of the day and also save face with the fans. If the Toronto Blue Jays could make the Phillies feel like they have Halladay for an unproven prospect if they want it, then the Phillies may be forced to move their hand. Roy Halladay puts the Phillies above any National League opponent. Halladay strikes out guys and gets them to ground out, two musts in Citizens Bank Ballpark. Halladay is a better pitcher than C.C. Sabathia and we saw what C.C. did in half a season in the N.L. last year. Roy Halladay would give the Phillies the best chance at a repeat and the ultimate pitcher to pitch against possibly the Yanks or Sox, teams they could meet in October. Bottom Line: The Phillies should go get this done, sign him to an extension and keep the Mets and Dodgers at bay. Halladay is a front runner, and so are the Phils.